When shopping for a gift that the sportsman in your life will love, you want to find gear that is multifunctional, light weight and if it’s fun, then that’s even better. Today, there are many products on the market that meet those qualifications, are easy to find and affordable. The following four gift ideas are guaranteed to please even the pickiest outdoor enthusiast. A sharp stainless steel knife is a useful tool for someone who’s camping, hiking or hunting. But what if that same knife also had a built in whistle, hammer, screw-driver, wire cutter and an LED flashlight? Those who spend a lot of time in the out-of-doors know that the unexpected is a common occurrence, so a simple tool that has multiple applications can be tremendously useful. You can find multipurpose knives, scissors, eating utensils, shovels and other small gadgets at most camping and sporting goods stores. They’re inexpensive gifts that are sure to impress. Solar-powered devices are increasing in popularity and with a wide variety of products to choose from, they make wonderful and fun gifts. Solar-powered chargers for cell phones, mp3 players, cameras and other hand held devices can help a hiker stay connected no matter how far out he goes. You can also purchase solar powered, shower warmer packs for the guy who likes to stay clean while camping in isolated locations. Solar powered flashlights and lanterns don’t require batteries, and solar powered temperature/humidity readers make it easy to keep track of the weather. Nothing is more important in the out-of-doors than being well hydrated with pure clean water, but water is heavy to pack-in and it’s difficult to know exactly how much one might need. A reliable, compact water filter solves this problem and makes a thoughtful gift. With a portable filter, it’s easy to drink from creeks and streams without worrying about possible ill effects. From inexpensive straw like systems that can filter up to 20 gallons of water and remove over 99% of water born pathogens, to light weight, hand-held three filter systems that purify up to 2 liters of drinking water a minute, you can find many options to choose from in all price ranges. If he doesn’t have some already, a good pair of waterproof, compact binoculars is a gift that any outdoorsman will find handy regardless of the activity he’s participating in. 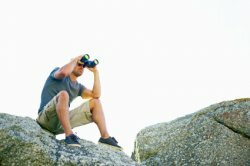 From getting a close-up view of a distant valley, to spotting a rare bird in the bush or a racked buck moving through a shadowy grove of trees, a set of binoculars is an essential part of the outdoor experience. A good middle-of-the-road pair will run less than a hundred dollars. If you want to make it a truly memorable gift, be sure and add a set of EyeShields. EyeShields are flexible plastic extensions made by Field Optics that attach to the eye piece of the binoculars to protect the viewers eyes from the irritation of wind and dirt blowing into the eyes while trying to focus on a distant object. They block outside light glare, and even make it easier to use binoculars in dim or poor lighting. They fold back easily when not in use, and if they are lost or damaged, Field Optics offers a warranty replacement. When you choose a birthday, Christmas or Father’s day gift for the man in your life, choose one that celebrates his hobbies and interests and it will be treasured for years to come.